Top patches - combination of onsies, t-shirts, sweaters, pants, receiving blankets, burp cloths, hat and a sock. Top border - Carolyn Friedlander Architextures Crosshatch in Grey (wide) purchased from Gather Here. Back - Alexander Henry 2D Zoo in Multi. Binding - Michael Miller Cotton Couture in Royal Hawthorne Threads. Let me introduce to you, Project Z. 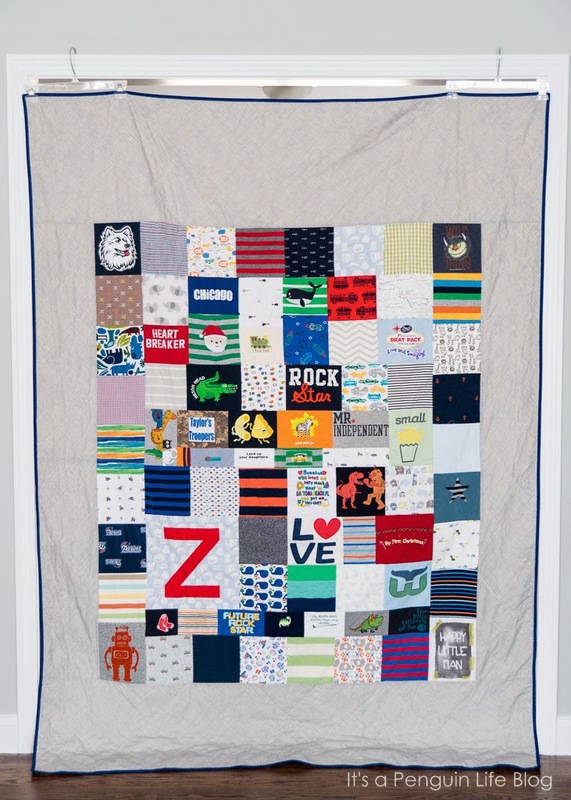 This was a quilt for my good friend's son, Z. My friend has been saving articles of clothing with meaning over the last 2 years. And I got to put them together into a quilt! I'm not going to lie, it was a lot of work, but it was worth it. I worked loosely off of Coconut Robots tutorial, I choose to use Pellon SF101 as my interfacing. SF101 is not only woven, but also 100% cotton. The woven texture would allow the quilt to fall and drape naturally. And anytime I can work with natural fibers, I do. The width of my blocks were mostly determined by the size of each clothing piece. Newborn sizes yielded smaller blocks, as one would expect. In other cases, the height of the graphic print dictated the height of the piece. I avoided cutting off images as much as I could. At the same time, I tried to maintain equal spacing on all sides of the image. Damn my OCD/Type A ways!! Most of the pieces interfaced, cut out, and ready to be arranged. There were a few tricky pieces that I had to get creative with. The yellow car shown below was just a tiny thing on the front of a zip-up hoodie (like a logo on the chest). I faked a larger block by cutting it out and appliqueing it onto the back of the sweatshirt. 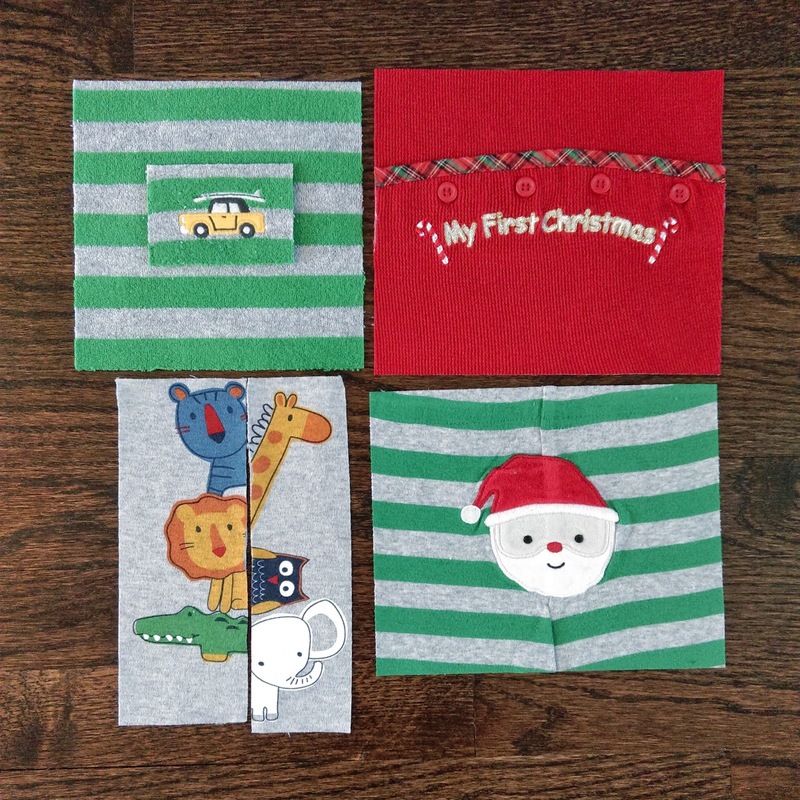 The "My First Christmas" block was actually cut from the backside of a footy pajama like piece. Seriously cute, right? To keep the flap from being accessed, it was sewn shut. Some of the more difficult pieces. To add another layer of personalization, Z's mom wanted to incorporate his initial onto one of the quilt blocks. 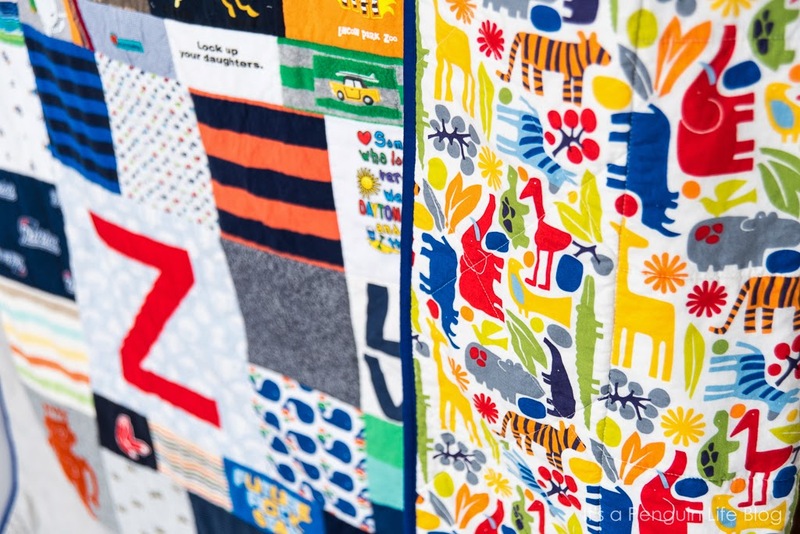 We chose to applique a "Z" to one of the receiving blankets cut into a large block. Hand cut from interfaced Michael Miller Cotton Couture in Cherry. Chubbs the Penguin was called on to help with the basting process. He wasn't much help. Lots of stitching in the ditch happened. It took some finagling, but the blocks came together with minimal resizing. This was one of those times that I had a quilt design board so that I could move the blocks around upright. Instead, I kept rearranging them on my floor. Watch some Law&Order: SVU, move some blocks. Watch another epsisode, move blocks again. And so on until I realized that I had to stop or the quilt would never be finished. There was a method to the madness. I tried to alternate dark and light blocks, stripes with small prints, and break up like colors. In the end, the quilt utilized 80 of the 81 pieces I was given! Since I couldn't being myself to quilt over the all the super cute graphics, I quilted around each block. There were a lot of threads to bury. It was a conscious and totally worth it, but wowzas! It's hard to see in the photo below, diagonal quilt lines were added just in the grey borders. The backing fabric was not only chosen, but also supplied by my friend. 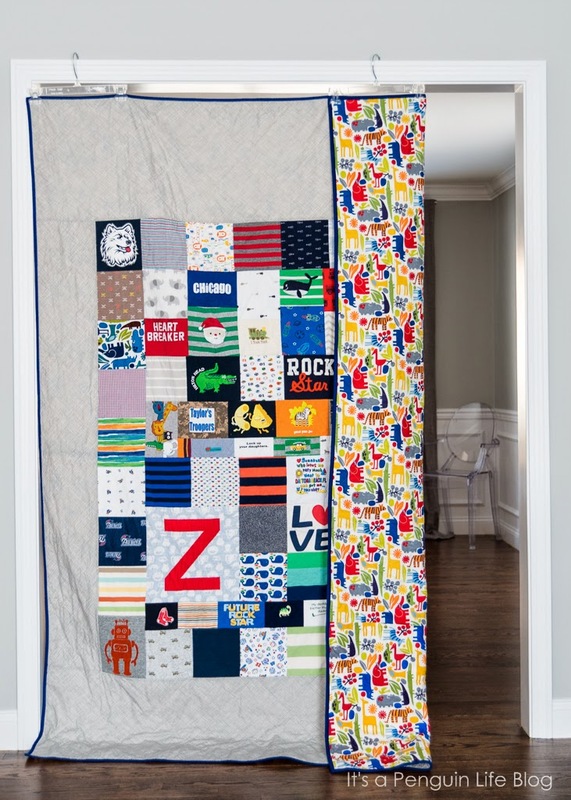 You see, this was leftover fabric used in Z's nursery! I LOVE how it all came together. Truth be told, I was sad to send it off to Z. I got a chance to experience it's coziness as I was sitting on the couch with the fireplace going... and tucking in the quilt tails. Thank you so much V (and M) for trusting me with Z's keepsakes. 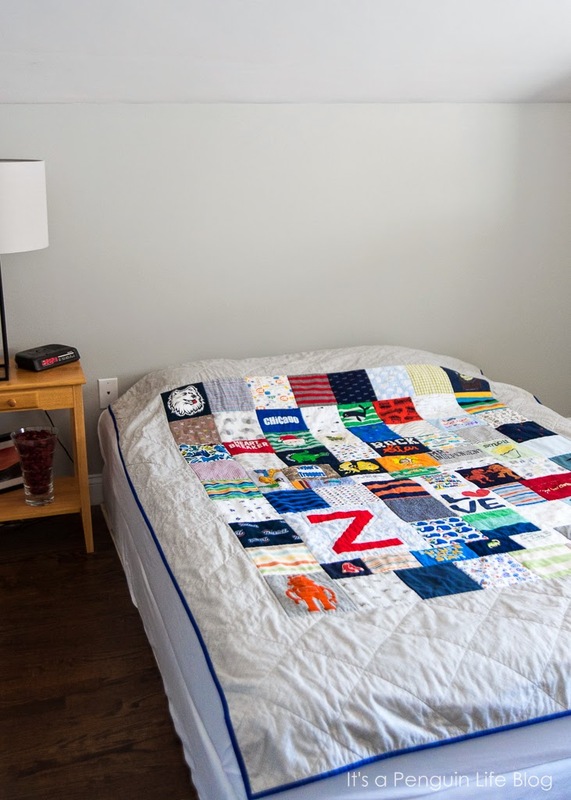 I'm so glad that I could bring your idea to life and create a completely one of a kind quilt for Z. I can't wait to see it on his big boy bed!